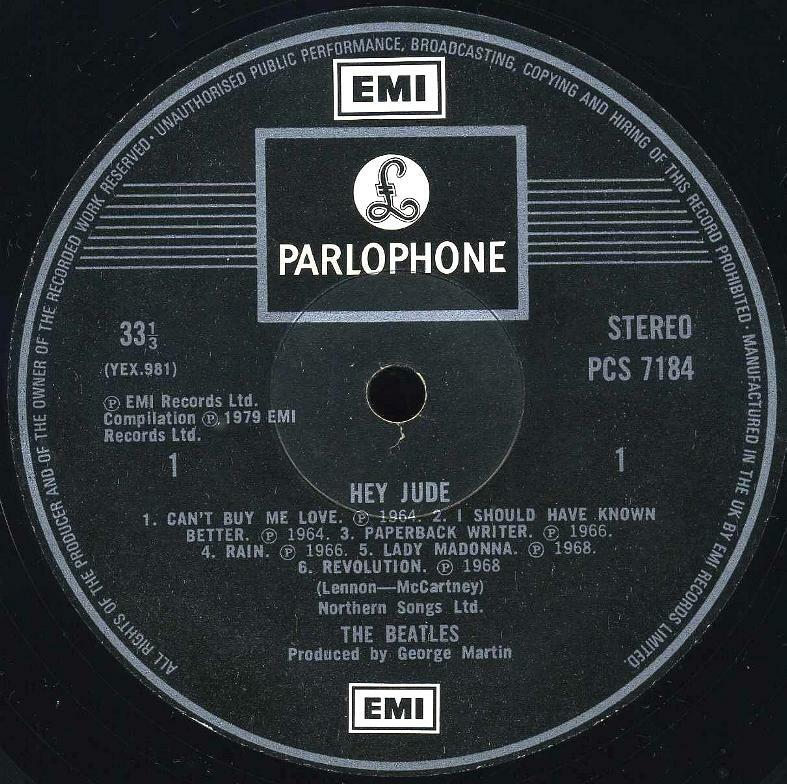 The Beatles Collection » Hey Jude, Parlophone PCS 7184. 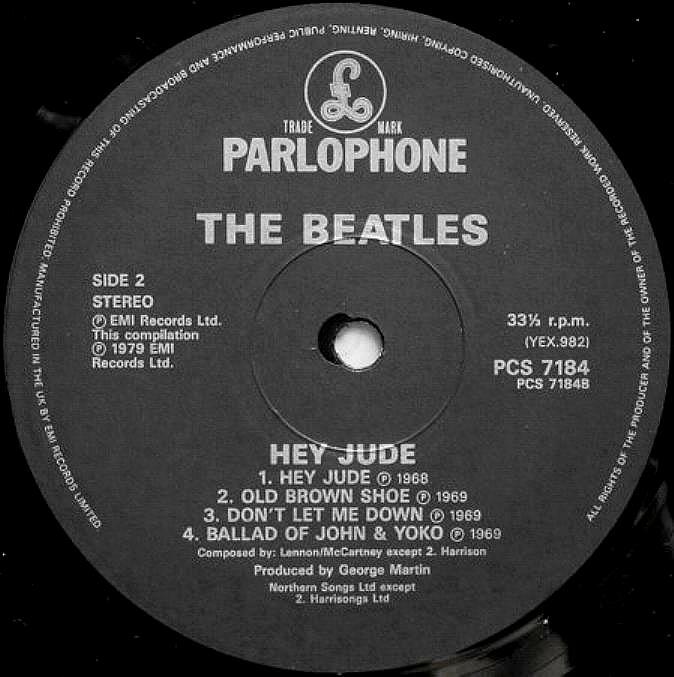 Hey Jude, Parlophone PCS 7184. Release May 21, 1979. Previously producible only on export to USA and British Commonwealth of Nations, this album eventually was official released in Britain nearly nine years after appearance in the USA. 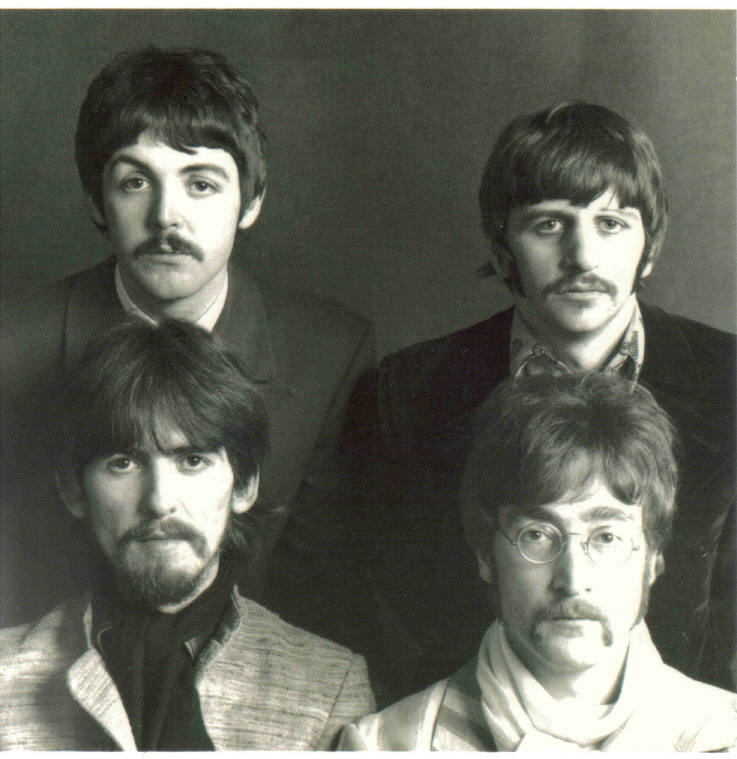 The album includes most of The Beatles’ later singles released in 1968 and 1969 together with both sides of the 1966 single “Paperback Writer”. 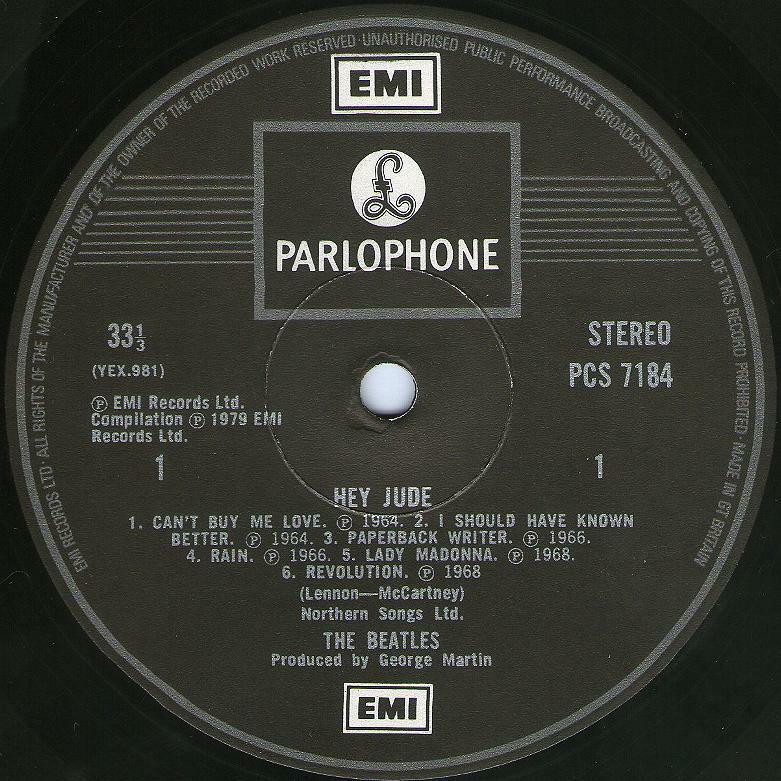 Two rather odd and out of sequence inclusions are “Can’t Buy Me Love” and “I Should Have Know Better” both from the “A Hard Day’s Night” album that were included in place of “The Inner Light” and “Get Back” even though their respective A and B sides, “Lady Madonna” and “Don’t Let Me Down”, are included. Full laminated “Garrod & Lofthouse Ltd” sleeve. White paper EMI custom inner sleeve. 1. 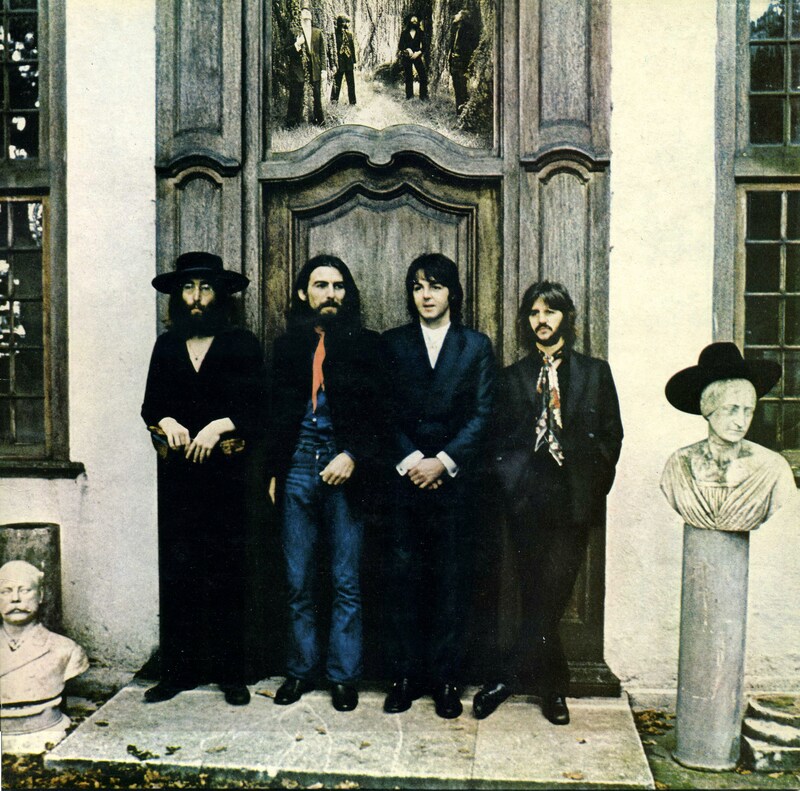 First pressing May 21, 1979. Black label with two white-black EMI logos and silver print. “The EMI Records Ltd…” printed at the start perimeter print and “Made In GT. Britain” printed at the end of the perimeter print. Matrix numbers: Side One: YEX 981-1, Side Two: YEX 982-1. 2. 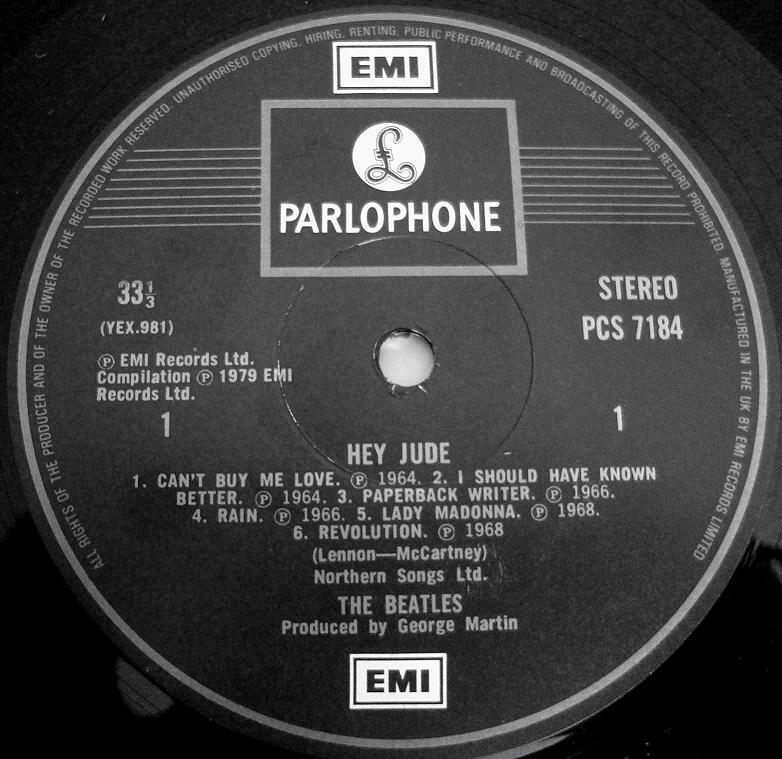 Second pressing October 1980 until April 1984. Black label with two white-black EMI logos and silver print. “ALL RIGHTS OF THE PRODUCER…” printed at the start perimeter print. Importantly, around the 11 ‘o’ clock position in the rimtext the wording is: “…UNAUTHORISED PUBLIC PERFORMANCE, BROADCASTING, COPYING AND HIRING…”. 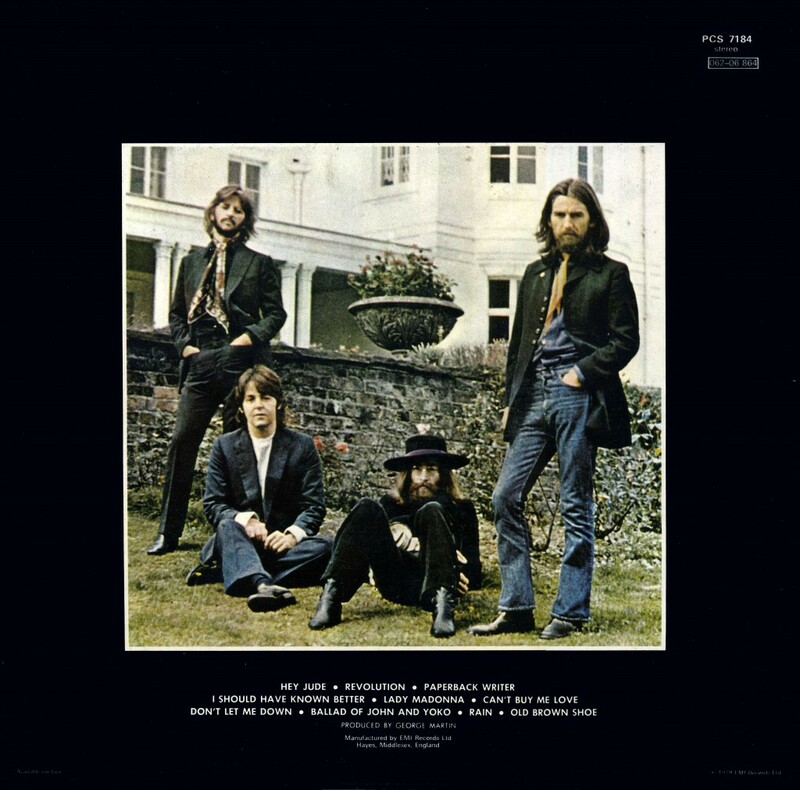 Instead, added “MANUFACTURED IN THE UK BY EMI RECORDS LIMITED” text at the end of the perimeter print. Matrix numbers: Side One: YEX 981-3, Side Two: YEX 982-1. 3. 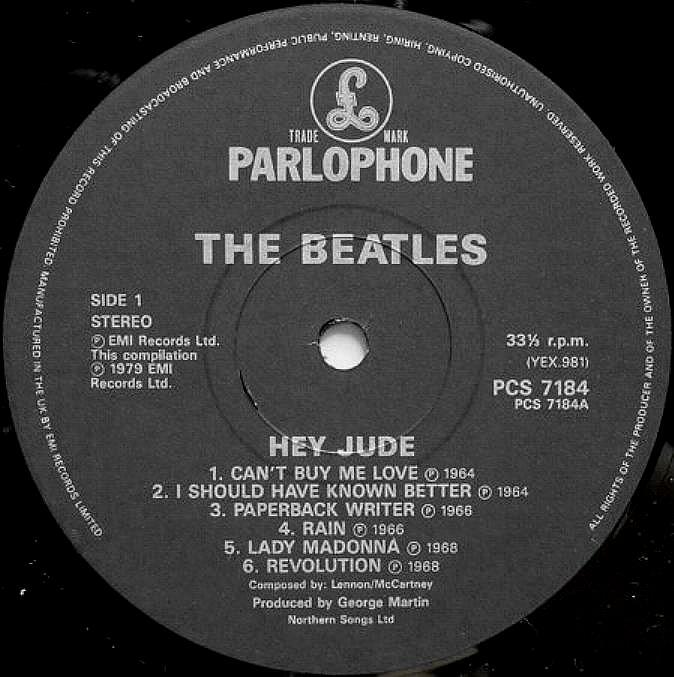 Third pressing, 1984 until 1987. Black label with two white-black EMI logos and silver print. “ALL RIGHTS OF THE PRODUCER…” printed at the start perimeter print. Importantly, around the 11 ‘o’ clock position in the rimtext the wording is: “UNAUTHORISED COPYIN, HIRING, RENTING, PUBLIC PERFORMANCE AND BROADCASTING…”. 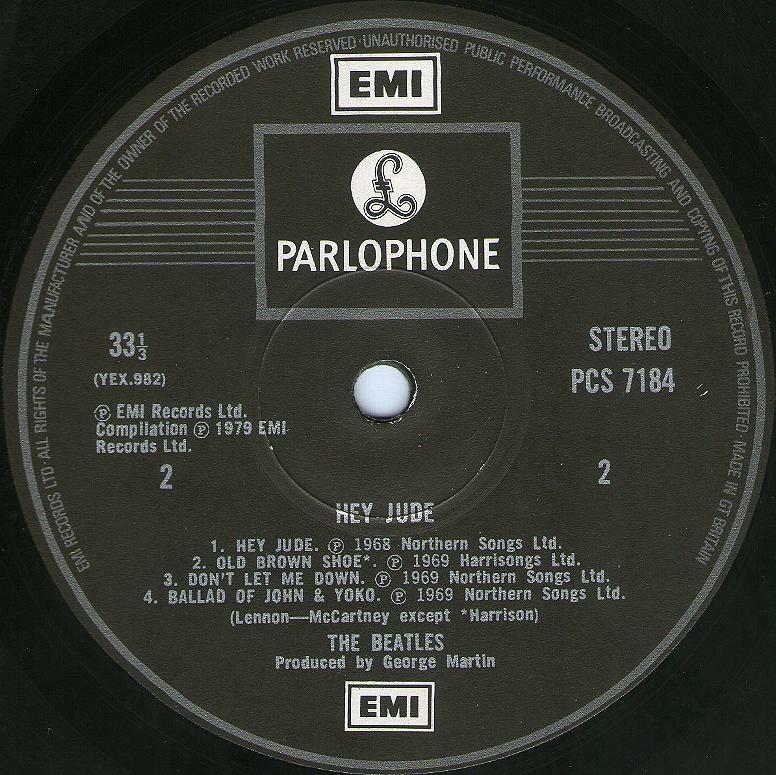 “MANUFACTURED IN THE UK BY EMI RECORDS LIMITED” text at the end of the perimeter print. Matrix numbers: Side One: YEX 981-3, Side Two: YEX 982-1. 4. 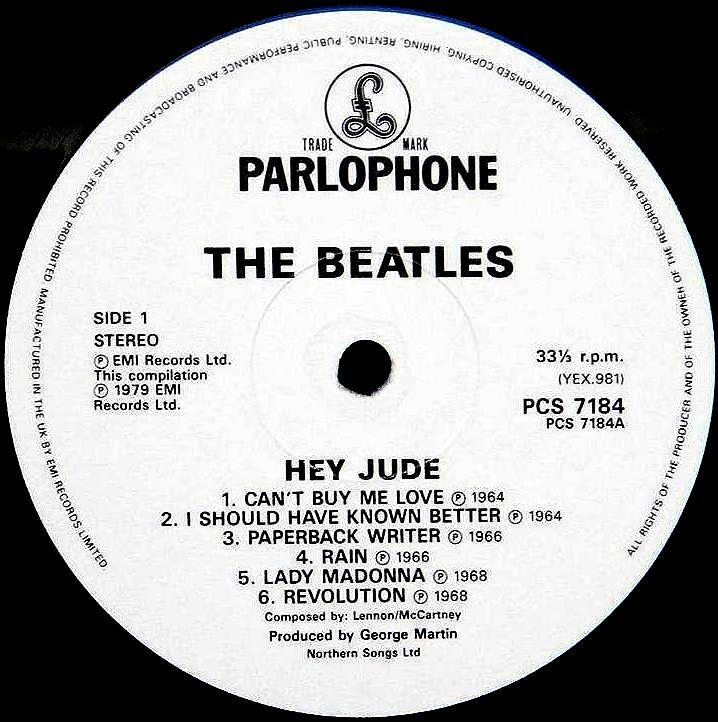 Fourth pressing, 1988 – early 90’s. Black label with silver Parlophone logo and silver print. “ALL RIGHTS OF THE PRODUCER…” right to left (reversionary) printed at the start perimeter print. Importantly, around the 12 ‘o’ clock position in the rimtext the wording is: “UNAUTHORISED COPYIN, HIRING, RENTING, PUBLIC PERFORMANCE AND BROADCASTING…”. 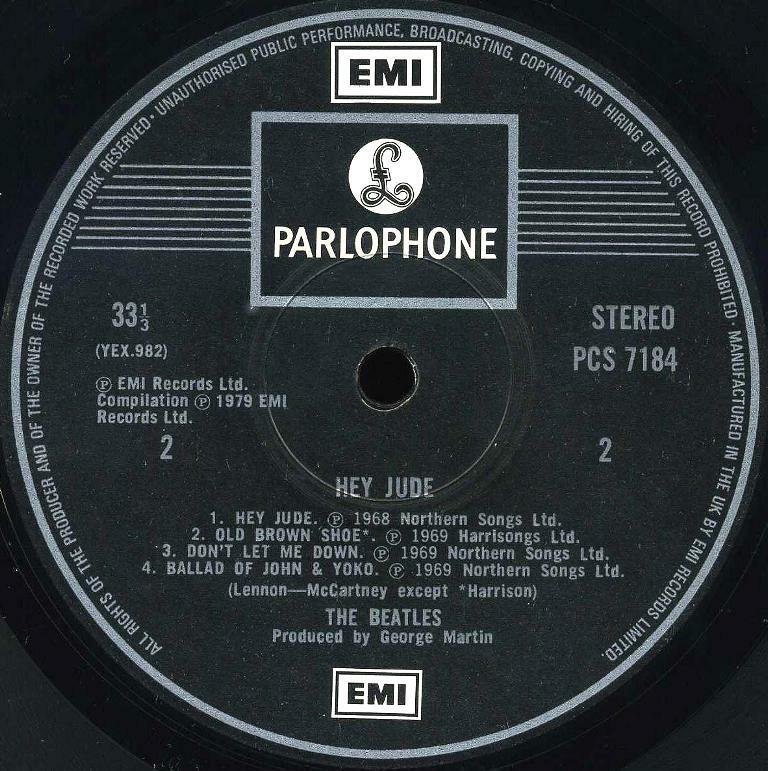 “MANUFACTURED IN THE UK BY EMI RECORDS LIMITED” text at the end of the perimeter print. Matrix numbers: Side One: YEX 981-3-1-1, Side Two: YEX 982-1-1-1. Variation A. Black labels with white prints. Variation B. White labels with black prints. This is vary rare label variation. We do not know what it is, misprint or promo copy. Maybe that’s just part of the circulation which was manufactured with white labels. This edition has a standard sleeve with the barcode on the back.